What is the official color for a Service Dog vest? Home > Blog > What is the official color of a Service Dog vest? We get asked that question, or a variation of it, numerous times a week. We always answer it the same way, what color does your service dog look best in? There is no specific requirement of the ADA that states what color your service dog vest should be. Actually, the ADA states that your dog does not need any special equipment at all. The color service dog vest you choose is up to you. Some may want to choose the traditional red or blue vest, others the brighter orange or raspberry, some may want to choose a patriotic camouflage color. Overall the goal of a service dog vest is to identify to others that your dog is a working dog, not a pet, that it is there to do a job for their disabled handler. 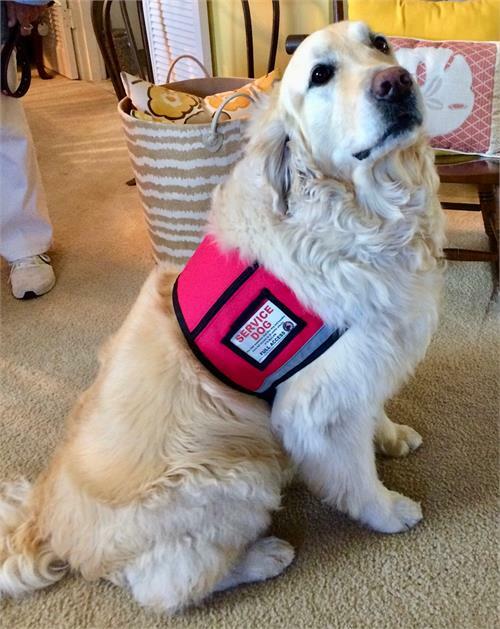 A service dog vest usually has patches on it that state specific things that the handler may wish to convey like “WORKING DO NOT PET” or “DIABETIC ALERT DOG”. These identifiers are important so the correct message gets displayed to the public as well as medical personnel in the event of an emergency. Other choices will need to be made before outfitting your service dog besides the personal preference like the vest color. Style may be the most important decision, the vest is more than an identifier, it is also a piece of equipment that can be helpful to the handler. Below are some different styles and their benefits to help you make this very important decision. Mesh vests: If your dog works outside in the summer heat you may wish to outfit him in a cooler mesh vest. Padded vests: If you need a handle on the vest for support you may opt for a service dog vest that has a built in handle. Vests with pockets: This vest style is very helpful if your dog carries items for you like medicine, keys or paperwork. The ability to carry small items can be very helpful to you while out in public. Small dog vests: Small dogs have unique challenges as they are easily missed because of their size, and usually do not like to wear bulky items. Specific vests made for small dogs may solve both problems. Lightweight, colorful vests may make the difference in your daily travels with your small helper. We hope that we have answered this age old question and opened your mind to the prospect of choosing a different color for your next service dog vest.